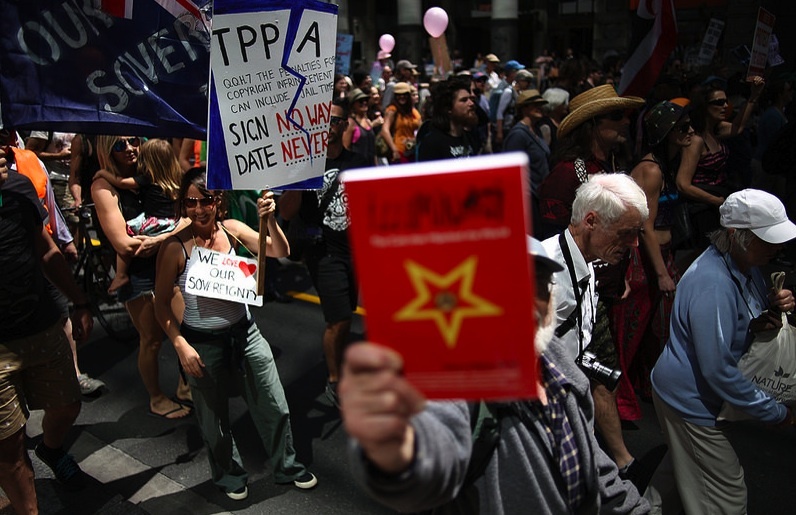 The Trans-Pacific Partnership Agreement issue needs to be taken seriously by New Zealand’s news media. 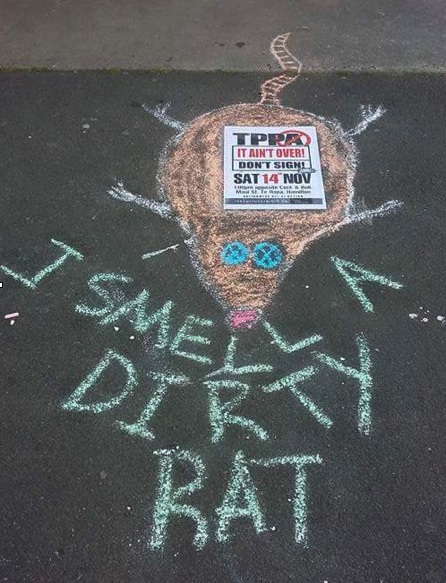 Last Saturday (14 November 2015), many news outlets including Maori TV, One News, The New Zealand Herald, the Sunday Star-Times, The Dominion Post and Radio New Zealand failed to cover the nationwide day of action to oppose the TPPA. 3 News broadcast a 1 minute story that showed pictures of the protests in Auckland, Wellington and Christchurch. 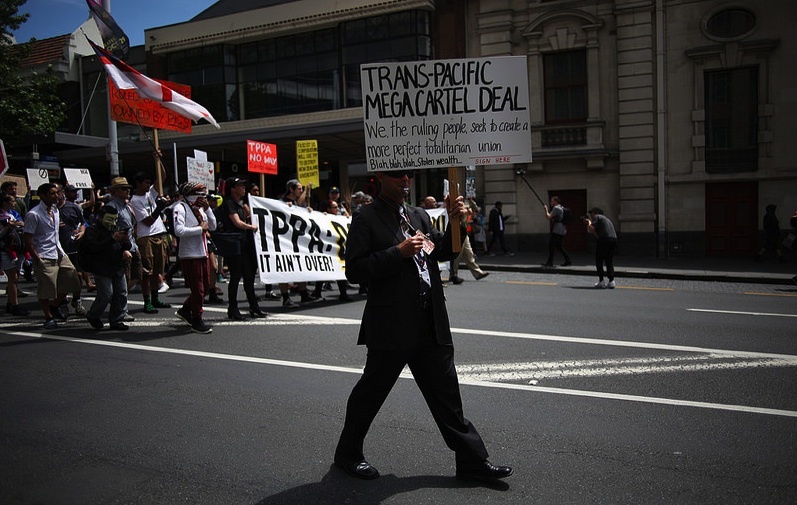 However, the network subtly promoted the idea that the Trans-Pacific Partnership Agreement can’t be stopped by saying, “Critics of the deal believe there’s still time for New Zealand to back out of the deal” and reiterated the point at the end. This fatalistic ‘Protesting is Hopeless’ tactic was used by the corporate media worldwide during the Occupy movement protests in 2011-2012. 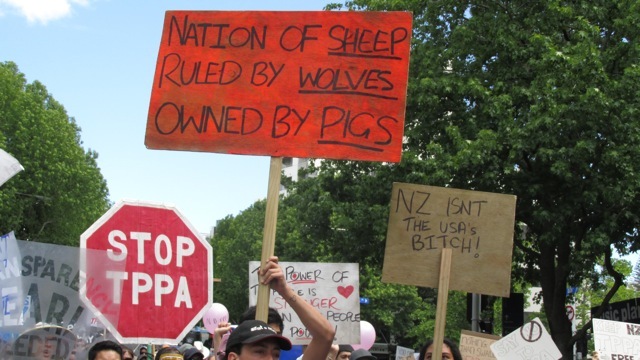 Other news outlets that did cover the rallies and marches were the Manawatu Standard, the Gisborne Herald, the Nelson Mail, The Press, the Rotorua Daily Post and the Otago Daily Times. Christchurch’s newspaper The Press reported that 400 people turned out in the city, where two Darleks were recruited to exterminate the TPPA. 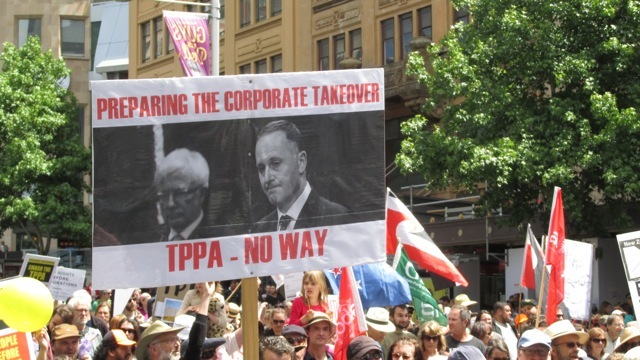 Tear it Up: The New Zealand government is the first to release the TPPA text, in keeping with the country’s long-standing role as a geographically-isolated lab to test public reaction. 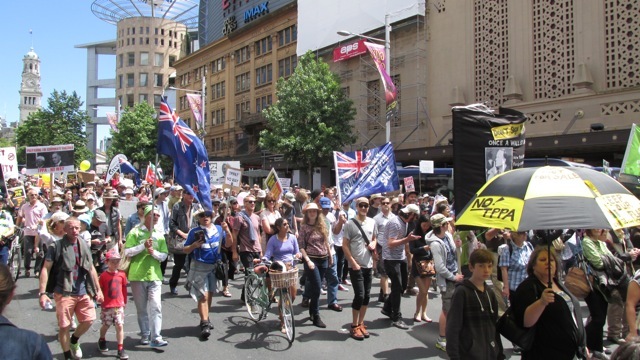 Despite the low turn-out of reporters on the TPPA protest beat, many videographers and photographers documented the November 14 nationwide actions, including long-time protest movement recorders John Miller and Gillian Hanley at the Auckland rally and march. 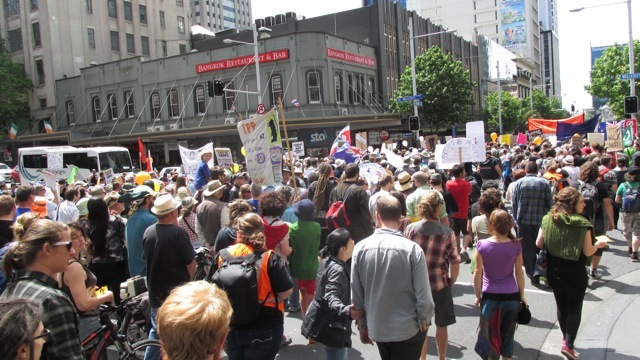 In Auckland, 7000-8000 people marched from Myers Park to the Ministry of Foreign Affairs and Trade (MFAT) building, blocking Queen Street and Quay Street by Princess Wharf in the process. Concerns about the Trans-Pacific Partnership Agreement (TPPA) are neither ‘conspiracy theory’ nor are they ‘boring’, which are perennial attitudes that persist in news outlets among reporters, editors and producers about issues that require a cerebral commitment to understand. Indeed, the issues captured by the TPPA are critically important to communicate. In an opinion piece entitled TPPA debate: We need a free trade of opinions in The Press, Donna Mojab-Miles made the point that the debate on the TPPA has, to date, restricted the “free market of thoughts and ideas”. Mojab-Miles argued that a healthy democracy requires people to be skeptical of those who wield power. Because the debate has been so limited, the majority of the public is unaware that a core pillar of the ‘free market’ facade has all along been to dominate and win a ‘war of position’ by making people think ‘There Is No Alternative’ (or the hegemony of TINA). In other words, the key insiders driving so called free trade agreements seek to shell-out democratic processes and transfer political and economic power to supranational institutions that are beyond the reach of nation-state populations. Their Global Neo-Colonial Project seeks to drown-out alternatives such as resilient, self-determining communities operating with cooperatives, permaculture principles and off-grid designs. In short, a global counter-movement – #WorldRising – is needed to dismantle the Global Neo-Colonial Project. One that articulates the alternatives, the projects, the inventiveness and possibilities imagined. Indeed, the Trans-Pacific Partnership Agreement (TPPA) is not so much a ‘free trade’ deal. This investors’ agreement is really a Mega Cartel Deal. Vast transnational corporations seek to create huge economic blocs to dominate markets, up the ante in economic warfare (or ‘the Shock Doctrine’) and construct corporatized totalitarian superstates, as Snoopman News made clear in a think-piece, Almost Fully Operational: The Mega Cartel Death Star. In other words, democracy is being shelled-out and replaced with hi-tech bureaucracies called technocracies, which are designed as totalitarian forms of government to be run by technocrats, engineers and scientists working on behalf of unseen oligarchs (or super-rich people). At last weekend’s Auckland rally, long-time activist and former politician Hone Harawira essentially incited rebellion saying that people are going to have to put themselves on the line to stop the TPPA, by blocking motorways, clogging the court system and forming a grand coalition of civil disobedience. 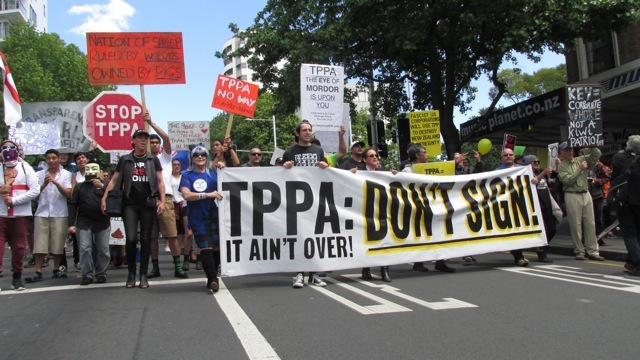 A Ngati Whatua spokeswoman emphasized that the TPPA is a sovereignty and constitutional issue. She added that there is a continuity of modus operandi from the time of the British Empire oppressing indigenous peoples in Canada, America, Australia and New Zealand, to the “Brotherhood” behind the TPPA, and that this “Brotherhood has been swapping notes for centuries”. 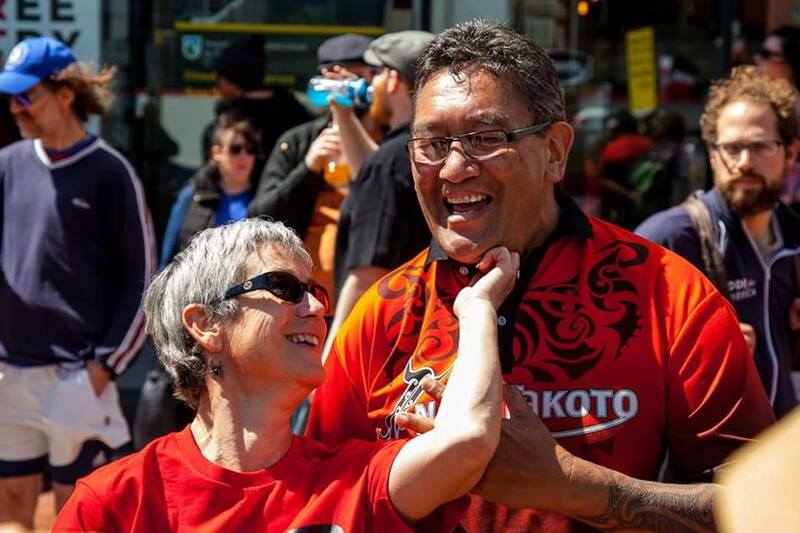 Fun in Protesting: Jane Kelsey and Hone Harawira know that battles with governments requires tenacity. 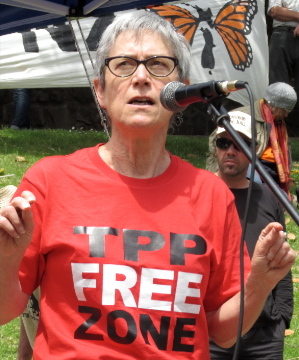 Auckland University law professor and TPPA expert Jane Kelsey emphasized that the deal is not signed and that it will be around February 5th 2016 that the TPPA is expected to be voted on in the US Congress, with the New Zealand government and other parliaments likely to vote around the same time. Kelsey said It’s Our Future.org and other groups would be calling on people to create TPP Free Zones, to write and present submissions, lobby their local councils about impacts on decision-making and to spread the word to influence iwi leaders to prioritize the issue. Kelsey also said new flyers for letterbox drops are going to printed that breakdown the TPPA text. The only reasons the text has been released by the New Zealand government is because Kelsey and others forced the issue in the Auckland High Court. And because of the groundswell of opposition forced the high-colluding parties in the 12 countries it impacts to ditch their planned four-year embargo. While the Jane Kelsey’s of this serially abused world unravel the 6000 pages of TPP text, major media outlets spread the propaganda that the deal was all signed, and the politicians such as John Key and Tim Groser acted with their cheesy smiling faces to hide the malicious intent of their oligarchic puppet masters. Notwithstanding this groundswell of opposition, the news media is inconsistent about covering the protests (and other actions). If the news media doesn’t take this transference of power upwards (or the attempted assassination of Democracy, Freedom and Sovereignty) to the super-rich owners of transnational corporate cartels seriously, then how are Amazing People going to know there’s economic hold-ups and attempted political murders in progress? Only a handful of news outlets gave pre-protest publicity to the November 14 nationwide day of action, such as The Gisborne Herald, Scoop News, 3 News, the Bay of Plenty Times, the Northern Advocate and NewsTalk ZB. The media needs to be cajouled and coerced into providing pre-protest coverage like sport gets (even though sports isn’t news), so that people know when and where the protests are happening and that there is a momentum to the movement. This can occur by inviting the media to pre-protest publicity events such as sign, props and banner-making working bees, pavement chalking and traffic-banner vigils that alert people to a coming action. 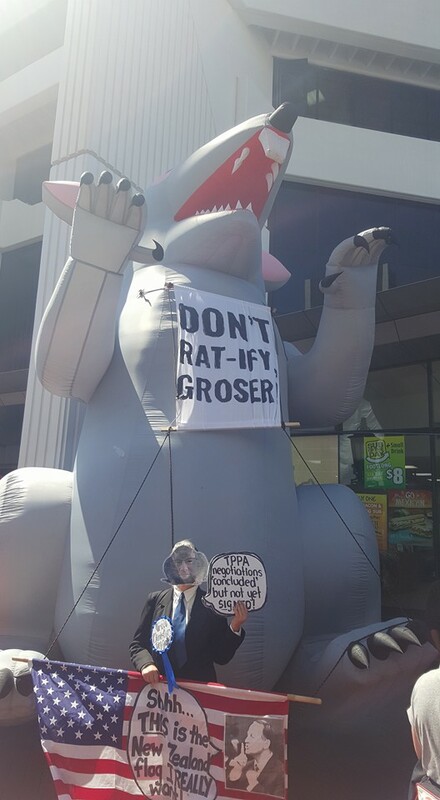 Perhaps the most effective tactic is have some pre-protest vigils outside the news media outlets themselves, with some of the signs saying, ‘Protests are more important than sports ‘news’, or ‘The TPPA issue isn’t meant to be off the news radar’. An Auckland restauranteur, whose premises was blocked by a police line next to the ground floor entrance to the Ministry of Foreign Affairs and Trade (MFAT) building, suggested the protest needs to be on a Friday afternoon “because that’s when all the suits are here”. Consistently covering the Trans-Pacific Partnership mega cartel agreement is really about holding those who accumulate economic wealth and political power by stealth to account. 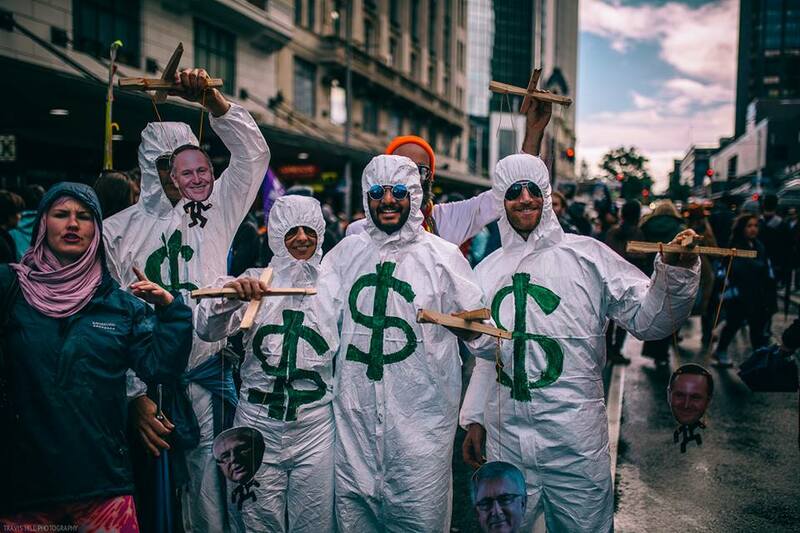 It’s also about gathering the eye-witness accounts of this vast Mega Cartel Hold-up – from the streets – while it’s still in progress and to find out the likely routes that the TPPA Get Away Cars will take. The use of metaphor is a powerful persuasive tool. For example, consider the ‘High Crimes in Progress’ metaphor that can conjure street theatre: 36 counts of attempted-assassination of Democracy, Freedom and Sovereignty in order to drive off in TPPA Get Away Limos with the stolen wealth of 12 nations. In any case, things must be bad if a pakeha male resorts to dressing as a corporate bandit with a Zoro mask to focus on sovereignty (pictured below). Especially, given that the native people of New Zealand, he tangata Māori, have been protesting their sovereignty since 1840 when the land-swindling New Zealand Company began marking land with survey pegs in what is now Wellington, the capital city. Back then, Māori pulled out the survey pegs when they learned their purpose. This is the kind of direct action that Hone Harawira alluded to in his speech. For the big picture context of the TPPA, see the Stars Wars-themed Snoopman News article: Almost Fully Operational: The Mega Cartel Death Star.